We’d love your help. Let us know what’s wrong with this preview of Sturmgeschutz III on the Battlefield 2 by Matayas Panczel. 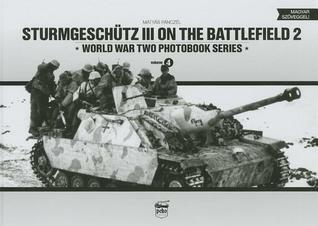 To ask other readers questions about Sturmgeschutz III on the Battlefield 2, please sign up. Short history of the Stug III provided over 2 pages. This book covers use of the assault gun from May 1940 to the end of the war. There are many photos I've not seen before, and a few I have. There are a few too many photos of destroyed Stug III for my interests (as a reference for modelling assault guns in use), but overall this is a very good reference. The photos are large, one per page. I'd say the book is worth half the MSRP, and if you can find a used copy for that price range it's a great Short history of the Stug III provided over 2 pages. This book covers use of the assault gun from May 1940 to the end of the war. There are many photos I've not seen before, and a few I have. There are a few too many photos of destroyed Stug III for my interests (as a reference for modelling assault guns in use), but overall this is a very good reference. The photos are large, one per page. I'd say the book is worth half the MSRP, and if you can find a used copy for that price range it's a great reference.